So I'm rewatching Ant-Man(thx Kmart). 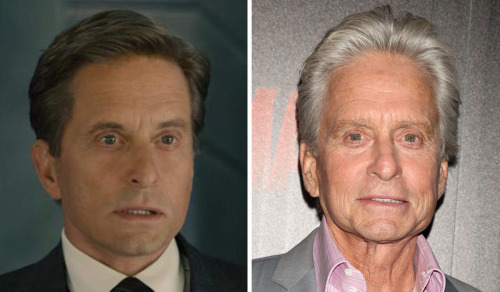 The start of the film has Michael Douglas playing a younger version of himself. He appears like he does roughly during the Oliver Stone Wall Street days. And it looks completely legit. This is made possible by de-aging vfx artistry by Lola VFX(the experts at this sort of thing). We know Disney is making Anthology standalone SW movies. One of those movies is supposedly based on Young Han Solo. It will be directed by the duo who made the really fun The Lego Movie for Warners. Well, what if they cast Harrison Ford as a young Han Solo? Why not? They effectively erased roughly 30+ years off Michael Douglas for Ant Man. So why couldn't they do the same for Ford and allow him to play himself? There's no need to recast the part(and really, who could play Han besides Ford?). So cast Harrison to play a young Solo and contract with Lola vfx to do all the de-aging stuff for the film. ILM can do the rest of the cool SW stuff. Last edited by ShaneP on Wed Feb 20, 2019 5:17 pm, edited 18 times in total. Except I'm pretty sure he only did TFA because he knew he wouldn't have to play Solo again. Oh I've no doubt Ford wouldn't do it unless he was paid a fortune and possibly not even then. Yes I was thinking of the Gemini Man film when I was writing this. It was at ILM and that was way back perhaps over a decade ago. I know the Douglas scene is very short but it was so damn good. It was seamless(typical for Lola though). The young Han Solo anthology is the one announced stand alone I'm most uninterested in simply because they'd have to recast the role. But why? All you will spend the whole film doing is thinking about how much this actor does or does not do things like Ford. So, just cast Ford in the role! Besides, this is not like James Bond. You don't recast these characters, same with Indiana Jones. Then again, they did it with Trek 09. Better off not doing it. Just can't imagine what the payoff is. If you recast that role, I feel sorry for the guy doing it because everyone will be doing nothing but comparing him to Ford. I feel bad for the people behind a Han Solo origin movie. Use old Harrison Ford and de-age him: get chastised for de-aging him because "the CG will be SOOOO obvious". Cast a younger actor that's not Harrison Ford (even well-loved A-listers like Bradley Cooper, Chris Pratt or Joseph Gordon Levitt) and get criticized for them not being Harrison Ford. Damned if you do, damned if you don't. Anywho, yeah, I'd say that by the time they actually get around to doing the origin movie, the CG tech will have advanced enough that we'll be able to convincingly make Harrison young for the entirety of the movie. Lola is great (read: phenomenal), but majority of their work is feature in short spurts, like isolated sequences (outside of Benjamin Button, but even then their work was split between DD and practical make-up work). I think they need some time to refine if they want to have a full two hours of young CG Harrison. Well, it's a flurry of news for this title. Directors Phil Lord & Chris Miller have departed the project with three weeks of filming remaining due to "creative differences". Everything appeared kosher, but the more articles come out the more that it's (apparently) revealed to be more than meets the eye. Ron Howard has been hired as the replacement director. I enjoy some of Howard's films but others…not so much. However, he is a real talent and they're likely looking for someone to just bring it all home at this point in the game. Last edited by ShaneP on Fri Jun 23, 2017 1:19 pm, edited 1 time in total. I enjoy some of Hoard's films but others…not so much. However, he is a real talent and they're likely looking for someone to just bring it all home at this point in the game. That's what I'm thinking, too. I said this on another forum, but... not to belittle the work of any creative director, writer or producer, but Disney/LucasFilm 'just' need someone to come in and finish the last 15% of the shoot and then work in post. A lot of work where a lot of creative choices are still made, but still. They don't need a creatively inspiring choice who is going to bring a whole set of fresh ideas to the table, they need someone who can finish what someone else has started. They need someone who can be handed a set of instructions and be told "follow this". A talented director who doesn't mind coming into the middle of a puzzle to finish putting the pieces together as he's told in the overall plan of what Disney, LucasFilm and Miller/Lord have set forth. Basically like a substitute teacher, now that I think of it that way. The lesson plans are already made, so come in, put the slides up and here's the answer key for their afternoon test. Julian Foddy is supervising London's portion of the fx work. Word came a few days ago that one of the producers on the show, veteran Allison Sheamur, died last week at the age of 54 after a short battle with lung cancer. She worked at Paramount, Disney and then went independent and co-produced Star Wars: Rogue One and then moved onto Star Wars: Solo. Her imdb resume doesn't even cover the years she was a development executive for Disney, Universal and Paramount, beginning with Disney in 1994. Just a sad and tragic reminder that life is way too short and cancer is a true beast. Didn't watch it so can't say how it was. Blackout! My god the full trailer looks really bad actors & story wise it seems like a bad syfy channel movie. They even directly rip off TESB falcon sequences! I thought TFA was bad this is a new low for Star Wars I hope they rethink what kind of movies to make going forward I cannot see this being popular at all the main actor is seriously flat & wooden & him & Lando look like pimps in those ridiculous looking overcoats. I watched the same trailer and actually loved it, thought Han /Chewie interaction worked, story looked exciting and the effects as expected just wow!After the first trailer I was really not feeling it but this has reversed 100% my thoughts on it. My only dislike is the ugly shoebox of a speeder and is it L3 the robot, just wasn't a fan of their designs. I read your description and caved! I watched it. It was actually GOOD! Ehrenreich's speech pattern and overall attitude seems to bring out a young Harrison feel. And his banter and chemistry with Chewie was terrific. That is crucial. The rest seemed good. Again, I remain skeptical of this more than any other SW film they've yet announced. I still don't see why they are doing prequels of the iconic characters(well, aside from $) but this trailer might just get me into the theater to watch it. Browsing the Solo page on IMDB the other day I noticed LOLA is credited. We all know what LOLA is famous for and I opened this entire thread with a suggestion they should work on it. Now, they did recast the role and Harrison did not play himself fifty years younger. They didnt do something as extensive and crazy as I originally suggested they should. But, now that LOLA is involved in some way.....what exactly are they doing? Intriguing. These trailers and spot look promising and the vfx seamless.